The National Print Museum offers and is continuing to develop an exciting range of guided tours, workshops and educational resources for young people. The National Print Museum offers interactive guided tour for young people wishing to visit with their friends or with a youth group. The Museum’s permanent exhibition is laid out in the same style as an old print shop with a Composing Area, Printing Area and Finishing Area and through this exhibition our tour guide will lead through the different stages of printing, from the inventions of Johannes Gutenberg to with the changes brought by early modern technology such as the PC’s and laptops we all use today! Please follow this link to our booking information page. 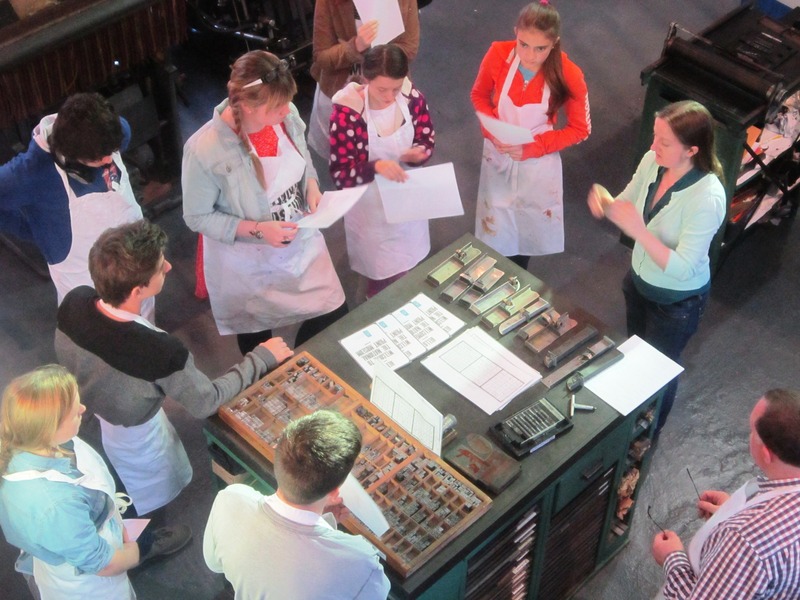 The National Print Museum hosts a variety of exciting workshops throughout the year, the majority of which are suitable for those aged 16 and over, such as Introduction to Letterpress, Calligraphy, Bookbinding, Printmaking – Etching, Japanese Woodblock Printmaking and many more. Private workshops in Letterpress or any of the those mentioned above can also be booked by youth groups or organisations. These workshops are subject to the availability of the facilitator. For more information please contact education@nationalprintmuseum.ie. Please visit our workshops page to find our more on dates, cost or to book a place on an upcoming workshop. Express Your Interest – Teen Workshops July & August 2017! The National Print Museum and NCAD are currently seeking young people to register their interest for print workshops inspired by the Museum’s current exhibition Green Sleeves, where participants will design and print their own music album cover. Two 1-week workshops will take place in July and August 2017. Cost €100 for 5 mornings. 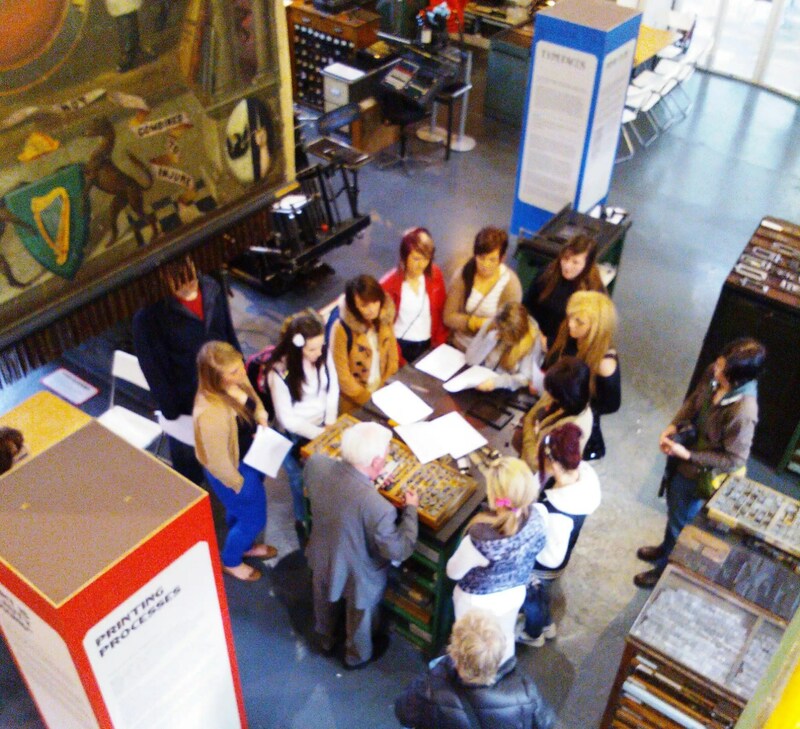 The workshops will take place at the combined locations of the National Print Museum and NCAD. Can you imagine Dublin in the future? Would you like to write about it? Dublin in the Coming Times is a free city wide programme of creative writing in which Dubliners, can create their own stories and poems as they look to the future of their city going through another phase of evolution and renewal. Fighting Words, Dublin City Libraries, and other partners including the National Print Museum, are working together with Dublin Unesco City of Literature to deliver the programme during 2016. The project is intended to enable Dublin’s citizens to participate in illustrating a vision of the city that, while it might change and adapt to new circumstances, will continue as a living, creative environment and a place for the storyteller and poet. At the National Print Museum, a free two-part intergenerational creative writing workshop will take place on Saturday 3 & Sunday 4 December 2016. The workshop is suitable for ages 14-18 years. Day one will begin with an interactive tour of the National Print Museum; featuring demonstrations from the Museum’s active retired volunteers, who are all from printers and compositors, and who have worked in Dublin’s print industry throughout their lives. The tour will be followed by a group discussion with workshop participants and the Museum’s volunteers about Dublin and their vision for the city’s future. On day two, inspired by day one’s tour and discussions with Museum volunteers, participants will take part in a creative writing workshop, where they will write their own stories about Dublin in the future with help and support provided by volunteer tutors. The Youth Groups involved in the project are from St. Andrews Resource Centre, Pearse Street and the Ringsend and Irishtown Community Centre. This project is supported by Dublin City Council’s 1916 Rising Commemoration Fund. Manifesto writing is a way to imagine different worlds. “Making Manifestos” is a project for young people aged 16-20 years of age. Over four days during Easter 2016, participants will create their own manifestos. They will devise and write personal manifestos at the dlr LexIcon, Dun Laoghaire, and then use these texts to design and print letterpress posters at the National Print Museum, Beggars Bush, Dublin 4. This is an active, practical and fun 4-day project incorporating creative writing, design, and print, during which participants will also find out about historical manifestos, including the 1916 Proclamation. The project is free and open to those aged 16-20yrs. Participants must be available to attend each day of the project.